There’s certainly a preaching-to-the-converted element to the Toronto Festival of Clowns. Or, really, any clown festival. It’s no secret that theatrical clown hasn’t exactly gained mainstream acceptance. Ask most people, and they’d probably tell you that Gaulier is a French fashion designer. So while the shows at this year’s festival contained everything from subtle character work to full-blown pie fights, it was the annual Masters of Clown night that made red nose connoisseurs drool. The lecture/performance hybrid featured John Turner (of Mump and Smoot fame) and Jan Henderson engaging in Q&As, punctuated with performances by Jeff Krahn (Fesso the clown) and Chris Gibbs. Turner noted the recent anniversary of Mump and Smoot, who turned 23 years old on May 13 (appropriately, a Friday back then). Turner met his partner Mike Kennard at a Second City workshop. Turner was dragged him kicking and screaming to a clown workshop, because, as he noted, he wanted to do comedy. The audience full of clowns who tend to define themselves by their teacher’s style raised their eyebrows, as Turner told them to stop doing exactly that. “If you define yourself by your teacher, you’re screwed,” he said. “Being an artist is just you. You can’t blame that on any teacher”. At the same time, he wholeheartedly supported extensive training. The biggest mistake is to take a two-week clown workshop and then try to clown. “You cannot get enough training,” he said. Jan Henderson provided a Powerpoint lecture, going through a short history of her own clown teachings before elaborating on the idea of the “Extreme Joey” and the “Extreme Auguste’. Henderson takes students through the experience of creating an extreme version of their two sides, the Extreme Joey being total selfishness and the Extreme Auguste being total submission. She recounted anecdotes of pairing students together against their types, and what discoveries each made about their characters in the process. Henderson also emphasized the importance of taking what you need from a teacher. “Everything I say to you will be a lie in a different context,” she said. Lest the academia become a little heavy, Jeff Krahn and Chris Gibbs performed extensive sets worthy of the “Masters” title. Krahn started his performance (as Fesso the Clown) by threatening to light his juggling torches, an act that caused an expensive visit from the fire department at the festival two years ago. 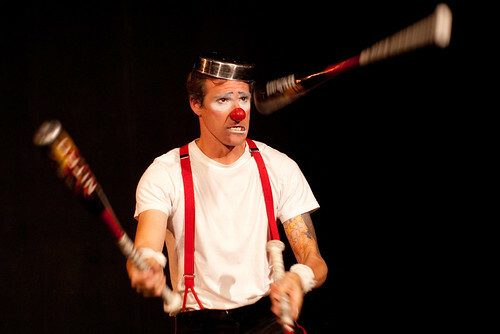 He stuck with the baseball bats instead, a moved through his impressive juggling repertoire from there. He also showed off a new twist on a piece involving a skateboard and a lot of height, which made me downright nervous even before the new twist. Even though I’ve seen Fesso do his thing several times before, the fact that his performance hinges so much on his relationship with the audience, it ends up feeling different each and every time. British-born Toronto comic Chris Gibbs, well known to comedy audiences in Toronto for his work with National Theatre of the World, closed out the show with a mix of standup and slapstick. Gibbs assured us that despite being on the cusp of portly, he was actually quite the acrobat. And… well… yeah, those cartwheels definitely caught our attention! With an improvisational style that makes even a jaded comedy reviewer (cough) unable to detect the difference between scripted and not, Gibbs is the kind of guy that you can watch, and watch, and watch – and never get tired of.